Flash drives. Whether you are a computer enthusiast or just a regular computer user, these 'geek sticks' sure caught on with the mainstream crowd -- it's extremely hard nowadays to find someone who does not own one of these. Being a general consumer product, sometimes aesthetics in relation to being a fashion statement is just as important as performance is to an enthusiast. This is made possible as technology advances to permit physically smaller and smaller units to be manufactured with minimal sacrifices otherwise. Today, we'll look at the A-DATA PD 17 USB flash drive -- it sure comes in a unique design to accommodate users desiring disks with great looks, but how well does it fit in other areas such as performance? Let's examine this drive to see if everything goes as well as its looks. Our review unit came very quickly in a FedEx International Priority envelope from A-DATA's American offices. Despite the fact that it is not enclosed in a bubble wrap, all the documents and evaluation unit of our A-DATA PD-17 flash drive arrived in absolutely perfect condition. While I have heard of A-DATA before, I've never given them a second thought until I put a little more research into their company itself. Although I do realize prior to getting hands on the PD 17 that A-DATA is not a 'generic manufacturer', they are in fact one of the larger memory manufacturers in Taiwan in both module production and flash products. They've got reddot and iF designs in various products as well -- seems like that they do have some pretty talented designers, and the newly released A-DATA PD 17 is certainly a result of this! As usual, opening the shipping package reveals the review unit in retail packaging. The retail packaging consists of a clear clamshell enclosure with the product itself physically displayed in front. Package design and information is printed on a separate piece of cardboard placed at inside as backing. The clean design on silver background uses a combination of clean curves and custom cropped images to make it a part of this design and comes off looking pretty decent. Drive capacity is shown on the front top right corner; our review unit has a storage capacity of 1GB as shown in the photo above. Out of the box, the only thing included is the A-DATA PD-17 flash drive -- no frills, no extras. An engraved line encircles the inner perimeter of A-DATA PD 17's top; with the center of the drive displaying A-DATA's logo. The bottom right corner of the drive itself is cornered in; with the side outer perimeter's silver colored trim continuing the general shape of the drive. This creates a hook location to attach lanyards -- however none are included in the package. The photo above shows A-DATA's PD 17 flash drive with the flash connector exposed. A view from the other side, and bottom of the PD 17 facing up shows a corresponding engraved line running on its inner perimeter. This makes it reciprocally identical to its top; the only missing aspect is the A-DATA logo. On the side of the drive, a black sliding switch aligned with A-DATA PD 17's silver trim allows the user to expose or hide its USB connectors. The above photo shows the A-DATA PD 17 with its USB connectors hidden inside. One thing I found less appealing on the PD 17 is its plastic construction -- the drive is made entirely out of plastic. From a durability and long lasting aesthetics point of view (Since we all know what it's like to have the silver paint peeling off plastic, and the scratches! ), I would much prefer to see A-DATA constructing this drive out of aluminum instead. A size comparison with different objects. From the largest to smallest starting on the left, the photo displays a set of car keys, then an OCZ Rally2 1GB (1st generation), SanDisk Cruzer Titanium U3 2GB, OCZ Mini-Kart (Photo displays a 2GB unit), OCZ Roadster 1GB, A-DATA PD 17 1GB, OCZ Trifecta 2GB, and a 2GB MicroSD card. As we can see from our size comparison above, the A-DATA PD-17 is actually roughly the size of a standard SD card -- except with rounded curves and sharper angled lines. After plugging the A-DATA PD 17 into our test system's USB ports, the first thing I noticed missing is a LED status indicator. It can really come in handy -- and personally it is my preference to see flash drives with a LED to see if the drive is receiving power, and if any read/write activity is going on. As we can infer from our custom proprietary APH benchmark graphs above, we can say from our Multifile Benchmarks that the A-DATA PD 17 is the third slowest in write speed, also the third fastest in read speed. 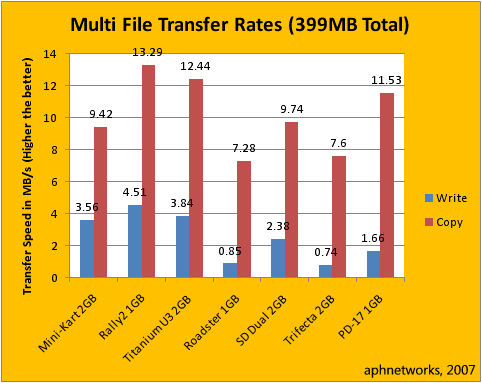 At 1.66MB/s write, it is faster than the OCZ Trifecta and OCZ Roadster, but behind the next highest whose score is at 2.38MB/s. The fastest drive in this category is the OCZ Rally2 with a write speed at 4.51MB/s. When it comes to read speed, however, the A-DATA PD 17 may be small in size, but definitely ranking at the top when it comes to performance. 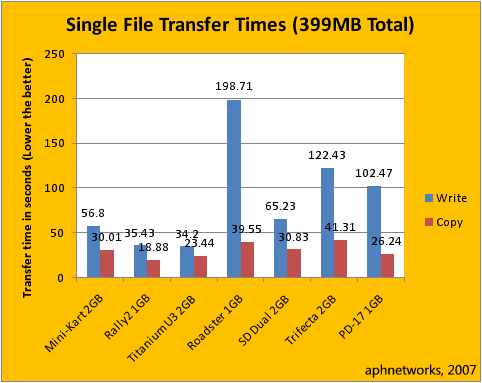 It trails behind OCZ Rally2 and SanDisk Cruzer Titanium U3's scores of 13.29MB/s and 12.44MB/s, respectively; at 11.53MB/s in our proprietary APH Multifile Benchmarks. In our Single File Benchmarks, it reflects a similar trend as displayed in our previous results. The A-DATA PD 17 was again the third slowest in write, but the third fastest in read. The "big two" leads the read test at 21.13MB/s and 17.02MB/s for the OCZ Rally2 and SanDisk Cruzer Titanium U3, respectively. However, the A-DATA PD 17 is not too far behind at a still impressive 15.21MB/s single file read performance. In terms of write performance, it is the reciprocal of what we can conclude from above. 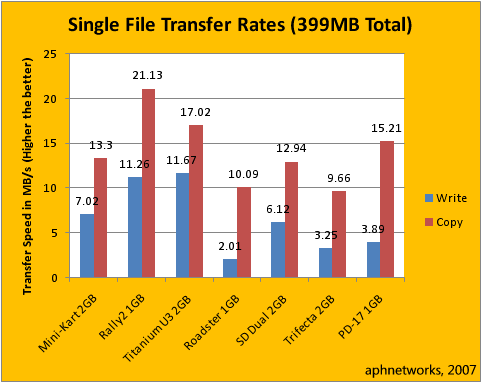 The slowest drives in this category is the OCZ Roadster 1GB and OCZ Trifecta 2GB, in which the A-DATA PD 17 leads the latter's score of 3.25MB/s at 3.89MB/s. For comparing drives of roughly the same size, I chose the OCZ Secure Digital Dual 2GB against the A-DATA PD 17. 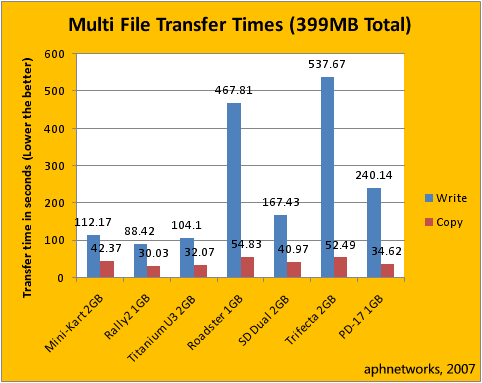 The reason behind this is because OCZ's Mini-Kart 2GB seems to have certain issues with HDTach (Although its real life performance is fine), and the OCZ SD Dual is one of the better performers in its size category. 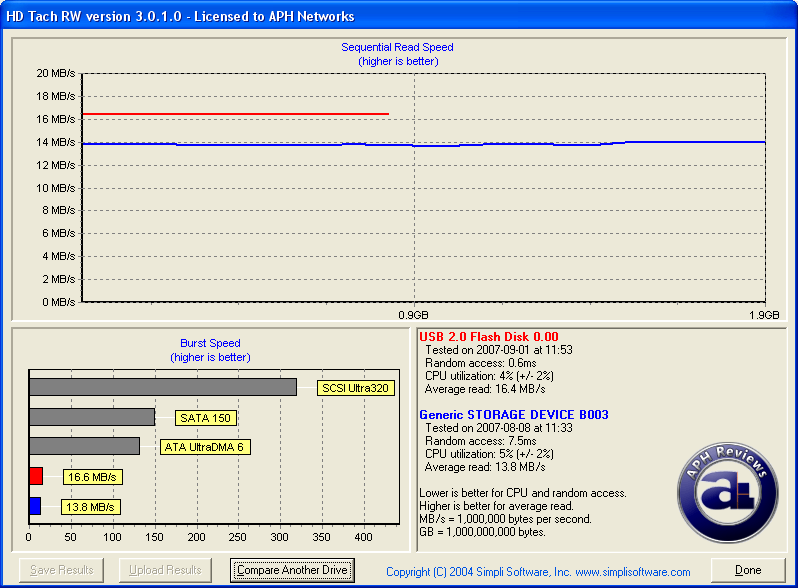 In our screenshot above, the red line represents the A-DATA PD 17 1GB, while the blue line represents the OCZ SD Dual 2GB flash disk in read performance. 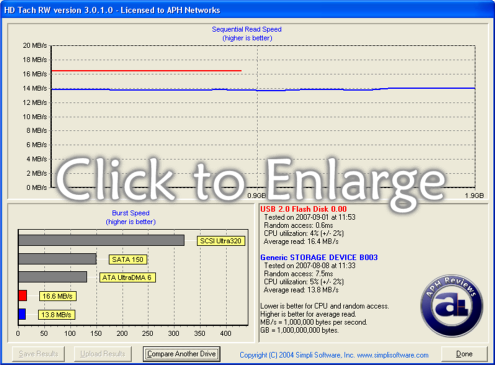 Performance is generally very solid for the A-DATA PD 17 1GB. Read performance is very consistent -- the line is completely flat. At 16.4MB/s with 0.6ms random access time, we can say that A-DATA's PD 17 1GB is definitely an excellent performer for its size. We are impressed by its HDTach results. The conclusion, the A-DATA PD 17 1GB is certainly a well designed, sweet little USB flash drive. By little, we really mean it -- it's physically small, and the physical looks aspect is done quite appealingly to most in excellent detail -- plus, it sizes up from 1GB to 4GB. With regards to performance, the A-DATA PD 17 certainly packs impressive read performance in such a small package. We can't say we are not surprised. Write performance can be improved; but it is still acceptable for its size category -- and we would have much appreciated it if A-DATA built this drive out of aluminum with a drive status LED. Special thanks to Vince over at A-DATA for making this review possible. The A-DATA PD 17 1GB is a sweet little drive with great looks and solid read performance. Improvements? Well, we'd always prefer aluminum construction, and by adding a drive status LED would make it excellent.